The IBM 4860 PCjr is remembered as a rather spectacular failure. In the home market, it wasn't much cheaper than an IBM PC clone, and lacked PC compatible expansion slots. In the educational market, the infrared keyboard was a disaster. In a classroom, all little Jimmy had to do to cause havoc was point his keyboard at Sally's machine and start typing. The stock "chiclet" keyboard essentially prevented touch-typing, although IBM shortly made available a replacement keyboard (as shown in the photo above) with real keys. The only way to expand a PCjr is via snap-on "sidecars" which contain things like expansion RAM, additional I/O ports, etc. There are two internal "expansion slots"; one is dedicated to a memory/display card, and the other is dedicated to a modem. They can't be used for any other purpose. 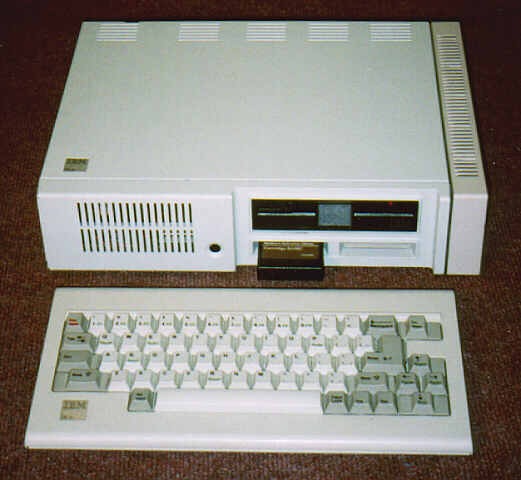 There is also a slot for the floppy disk controller, but virtually all PCjr machines were sold with a floppy disk drive. This was the 1980s, and cassette data storage was behind the times! Another failing of the PCjr was its host of non-standard interface connectors. None of the connectors were the same as the PC. 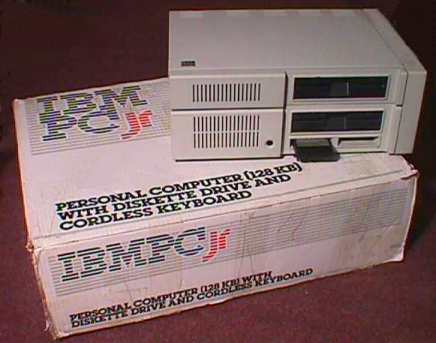 Here are some rare PCjr boxed accessories, including a joystick, the Serial Adapter Cable (which allowed the use of standard serial devices instead of those built for the PCjr's bizarre cable pinout scheme), the IBM Color Display Adapter Cable (ditto), and the PCjr Television Adapter (RF modulator).